On Saturday I went to York Clandestine Cake Club‘s event which was to be held in the restaurant of the National Railway Museum in York. I was really looking forward to going as Rachel, the organiser had chosen such a super venue and a brilliant theme to be incorporated into cake! A huge thank you to Rachel for all the time that she spent into getting the venue and the event organised and it was lovely to catch up with everyone again. As my Dad worked for British Rail for nearly 20 years, railways and trains are very much in my blood. Please don’t write me off as a spotty, anorak wearing nerd but I do love train travel. I was fortunate enough to have free first class rail travel in the UK and great discounts on fares throughout Europe as a child. How I wish I still had that now, I would never be at home! Thankfully my family railcard helps out a bit! Naturally, I took advantage of my Privilege Travel card and went on all sorts of trips up and down the UK. I even incorporated two tours of Scotland by rail as part of my student days. So, as you can imagine, the National Railway Museum has become a special place for me throughout the years. After booking my place at the event, I then thought how on earth am I going to replicate a cake on a train or a transport theme? I had very limited time to be really creative as my children were off school last Friday on their school training day. They wanted to go into town to meet their friends so any cake I baked would have to be done in the evening. Once again, the fabulous Clandestine Cake Club book came to the rescue. 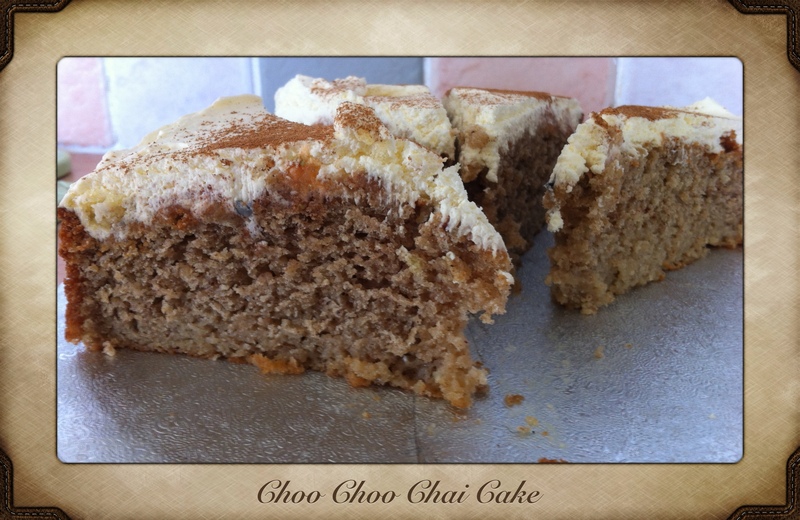 When the book came out back in February, I noticed a gorgeous sounding cake called “Choo Choo Chai Cake” This so called cake was inspired by Loughborough Clandestine Cake Club’s event held in a 1940’s style tea room on Quorn and Woodhouse station on the Great Central Railway in Leicestershire. As a frequent visitor both as a child and with my two children for the Santa Specials in recent years, I love the Great Central Railway. The cake in question was a Three Milks Cake, but the recipe creator Janet Currie decided to incorporate her love of chai tea into the cake. Judging from the response the recipe has had, I was desperate to have a go at it myself. The three milks are actually a soaking syrup which you pour onto the cooked cake. These were double cream, condensed milk and evaporated milk then mixed together with a chai syrup. I didn’t know where you bought the chai syrup so I used some chai tea bags which I had bought previously from my local Booths. These were infused in water and sugar. The cake was deliciously aromatic with spices, there was vanilla, cinnamon, ginger, nutmeg, cloves and cardamom in the cake itself and more cinnamon was dusted onto the finished cake with my dredger. I must admit I did panic when the cake was cooking as I did not know what the texture would turn out like. There seemed to be rather a lot of pouring syrup. I was worried that if I put the lot on the top it would fall apart and all I would have was soggy crumbs. I mentioned this on Twitter as I wasn’t sure who out of my Cake Club friends had made the cake. Fortunately, both Lynn Hill (Clandestine Cake Club’s founder) and Janet Currie herself tweeted back and I felt reassured. The cake had a delicious whipped cream topping dusted with cinnamon. On Saturday morning after the soaked cake had been in the fridge overnight I made up the optional topping. 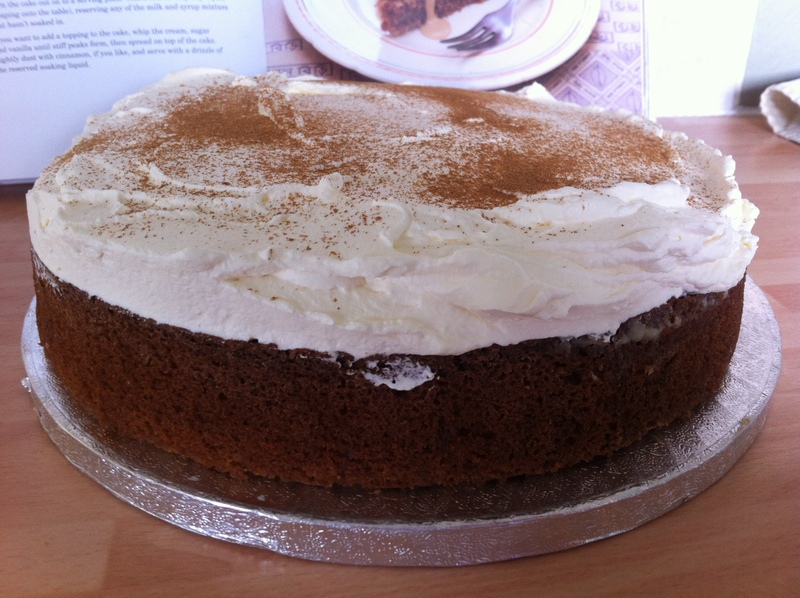 This was a simple whipped cream, icing sugar and vanilla extract frosting which I thought finished the cake off beautifully with the dusting of cinnamon on top. There was a little bit of cream left over. 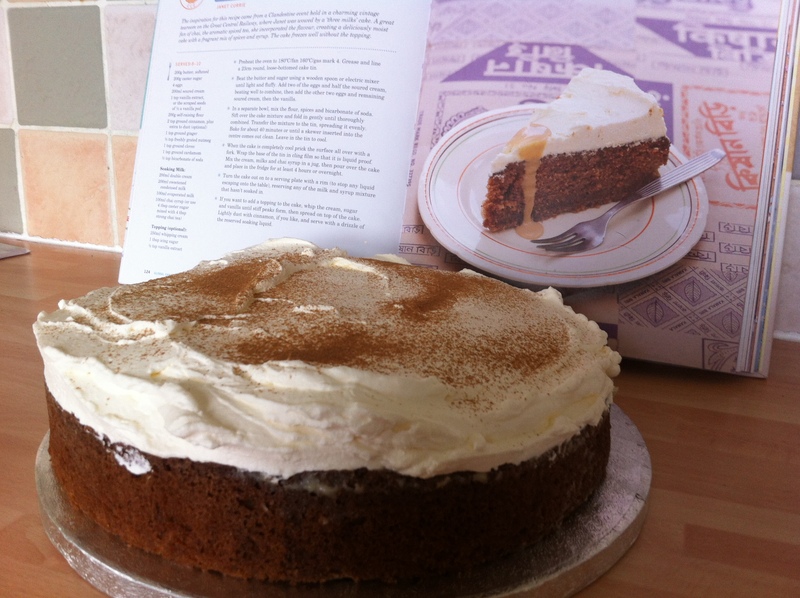 Here is my version of the Choo Choo Chai Cake with the real version photographed in the book behind! At the Cake Club event on the Saturday afternoon there were some delicious cakes to choose from. Sharon had made a wheel cake which was a Lemon and Poppy Seed Bundt topped with a liquorice icing and Black Jack sweets! 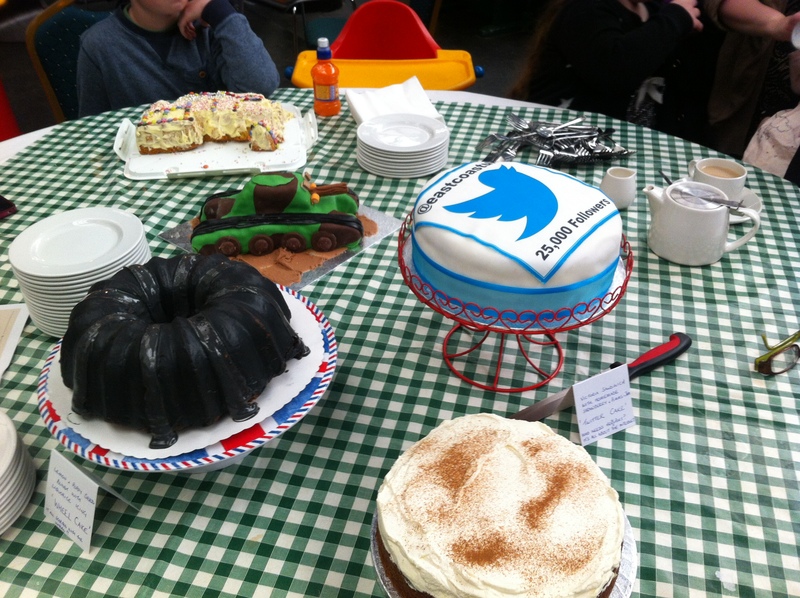 She had also made another cake for East Coast Trains marking their milestone of 25,000 followers on Twitter. You can read more about this on Sharon’s own blog here about her exciting adventure with the Skyfall train! It was an added bonus to see the Skyfall train in York station on it’s way down to King’s Cross from Edinburgh! 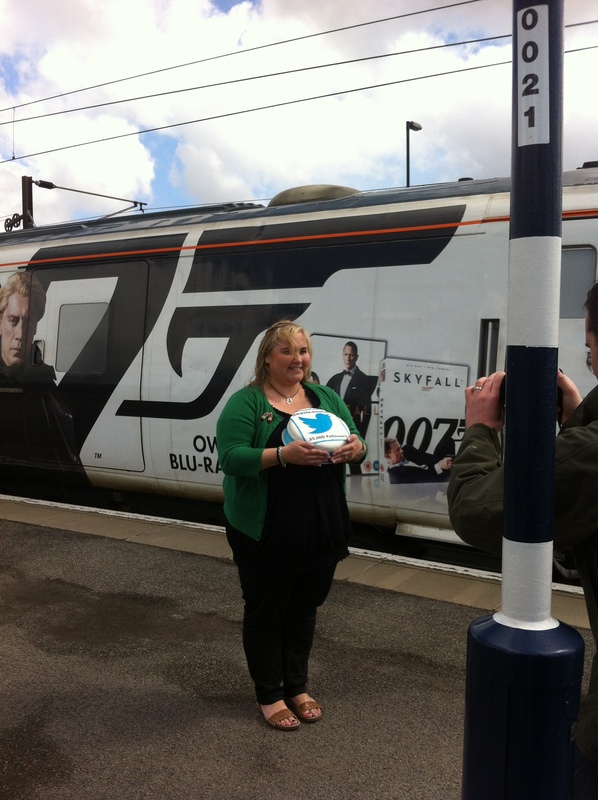 Sharon from Pudsey and West Leeds Clandestine Cake Club having her photo taken with the Skyfall train on York Station. Rachel had also made a yummy train cake decorated with sweets and sprinkles. There was also an army tank made by Mel which contained great camoflage in the mixture as well as her children’s spaceship cake. Here are all the delicious cakes laid out on the table ready for our Cake Club to start. I took the leftover cake back home with me as the children wanted to try some. We ended up having a slice for pudding after our Sunday lunch. Would I bake it again? Oh definitely, it was a winner all round.